What a FANTASTIC fantastic story. To think I missed out on this beauty, intensity and heartbreak over the word “fantasy” for a year or two, when all along, every bit of the “Kristen Ashley fervent alpha-male love story” I was craving was right there, ready and waiting for me. *sigh* Blasted me and my genre-bias!! And the worst part is I probably won’t learn my lesson. I’ll still shy away from the “fantasy” genre. Except for anything “fantasy” from this author. I. Am. Sold. Claudia: I’m into Fantasy but definitely going to try the Fantasyland series by one my favorite authors (Kristen Ashley) Thank you Maryse!! Ashley: I have never been super into fantasy, but I started reading Wildest Dreams and it’s so…..KA with fantasy mixed in. It’s writing like I can’t explain. Loving it! Marissa: I’m half way through Wildest Dreams and loving it. I’m not one for paranormal/fantasy (if that’s what you’d call this) but I should’ve known…it’s Kristen Ashley; of course it’s fantastic! Kristin: You will feel everything down to your bones! This book…for me…was the Fantasy version of Sweet Dreams. I felt it that deeply! Enjoy!!! So I cheated going into this. Not to say I won’t be backtracking and reading the rest “in order” but I skipped right to book #2 simply on the spirited adoration of this book by my fellow readers. (P.S. Here’s the The Fantasyland Series Reading Order). That many enthusiastic comments, and adamant recommendations couldn’t be wrong. And like I know Kristen Ashley’s stories, I knew this wasn’t just going to be a “new fantasy world” for me to experience. Now wait… I know to fantasy-lovers, my claim of “just” a new fantasy world sounds blasphemous and silly. After all, even I have connected to a few a true “fantasy” stories. And while I can appreciate them and even reflect fondly upon the few I have enjoyed, I tend to not gravitate to to the effort needed (from me) to learn, adapt and connect to them. They’re intricate, deep, detailed and kind of… at first, unrelatable. But the comments for this one? I knew there was going to be that something about this that was going to be pure Kristen Ashley. Pure “modern” woman. Pure girly-girl. Pure me, that I could relate to in every way. Oh sure, there was plenty to learn, and deal with. Languages, customs, living arrangements. But ALL of that was done through the eyes of a 30-something, modern day Seattle woman. Because you see… this one had a touch of that “time-travel” by accident thing going on. Mind you we have no clue, what, why and how this all happened. But it was HUGE. Powerful. Painful. And… phenomenal. Circe (yeah… that name had me on alert from the start ’cause it had that “mythology” feel to it) is a 30-something woman amidst a sea of men. Her family. Brothers, loving father… raised in a happy, loving (albeit a a little sad without her mother) environment. Stable, steady, strong and secure. Maybe not deliriously happy and loving life, but content and maybe not realizing that she was. Until she is startled out of a dead sleep, finding herself in a cage of strangely dressed women. I didn’t know where I was or how I got there. I wasn’t certain what was happening. I went to bed in my bed in a world I understood and I woke up here in a world that was entirely foreign to me, everything about it, and not one thing about it was good. Some of the women were excited. Some scared out of their mind. On her way to a “hunt”. Where warriors (think “Khal Drogo“) from “Game of Thrones” choose their wives from a parade of women. Some women raised… trained to be the wife of a warrior, and some simply kidnapped from other lands and brought against their will. I looked at the Korwahk women. It was true. It was insane, but it was true. I was trembling from head to toe and I wanted to bolt. I wanted to run. Doesn’t matter. If a warrior chooses you, chains himself to you… you are his. Oh sh!t. Oh God. Oh Sh!t. And the claiming is brutal. Circe is claimed by none other than the King of this land himself. Having waited out years of “wife” parades, not claiming any of the beauties and “fangirls” (yep, it was full on “groupie” mode during the parade when they passed his throne – each woman hoping to get his attention). He ignored all of them, awaiting his perfect chosen one. And he spots her (the golden one) right here in this very parade. “He saw me,” I whispered. I nodded. “Maybe he didn’t,” I said softly. Lucky Circe (or unlucky… at first). ‘Cause she’s the one. And this is the INCREDIBLE love story of Circe and Dax Lahn (King Lahn). Fear and hate at first, while Lahn does what he will, for he is a warrior. And worst of all, he is KING. Never to be denied. Alyssa: There are many of “those parts!” Which one????? Maryse’s Book Blog: OMG this is INTENSE!!!! That speech she gave him. I just want to cry… About her amazing protective father… in response to Lahn’s *ahem* (ROAR!!!!!!) actions… “But you should know this, my king… if he knew you, he would not like you.” I am devastated. Jacque: Oh its better….. keep reading, don’t sleep. Jennifer: Love it, love it, love it! Sam: Omg, I’m at the exact same spot as you Maryse!! I’m furious!! I don’t know if I can get past that, I just can’t believe it!! Grrrrr!!! Sarah: So many good book feels! This book makes you feel everything. Rhonda: Me too!!! The translations are killing me!!!!! Destini: I LOVED this book!!!!!! Erin: LAHN is MY MAN!!! Brandie: My favorite in that series for sure! My emotions were all over the place but in such a good way. He pissed me off so many times but she did too near the end. Loved it, loved the way it ended. Just perfect. Britton Copeland Epps Lahn is my favorite alpha male ever!!!! Natalie: This is one of my top 6 Favorite books EVER. I have read it at least 5 times! Hang: Maryse, you’re making me want to re-read!!! Dax was so intense and the end…OMG! Alyssa: Did you stay up all night and have your heart broken, mended, laugh and cry????? I didn’t want to be stuck in this world. It frightened me. Not only the culture I’d been thrown into but whatever power might be out there that took me to it. I had to admit some parts of it were interesting and some parts even cool. But the rest scared the sh!t out of me. And I worried about my Pop. I worried that he was frantic, wondering where I was. … hatred, and pure unadulterated happiness… mixed throughout. I felt it ALL. But no worries. Circe is a strong woman. Circe’s will to live, and desire to be happy despite her circumstances (after all … she has NO choice in the matter) has her fighting, reasoning and showing the King how a woman of today, of our world, likes to be treated. As do all women of the worlds. Ours… and others. Circe, the modern woman that she is, is adept at adapting, accepting and making the best of her new life. I know the strong-willed women in us wants to resist, and deny, and not accept this kind of “love”. Their way of life, the man demanding, the woman succumbing. But Circe’s strength shines through all of the King’s (and his warrior’s) tyrant tendencies. Her will, her strength, her compassion, and her savvy ability to communicate, convince in such a subtle yet undeniable manner (and at a times, debate, even) slowly breaks through. She’s convincing. She’s right. And the connections made are profound. Even with concessions on her part. And concessions on theirs. I… pretty much highlighted the WHOLE book. Even the darn baby-tiger. Hehe. Maryse’s Book Blog: OMG! 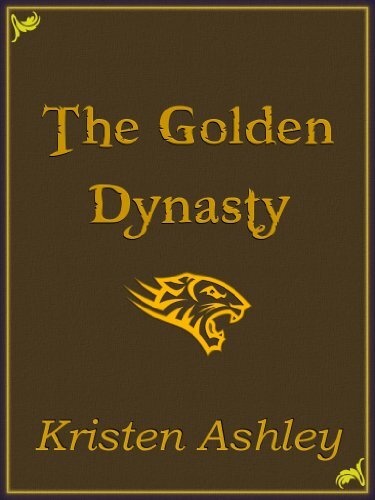 The baby tiger in the pen is Kristen Ashley’s “The Golden Dynasty” is killing me in awwwwwwww-ness. I am loving this book so far! I can’t stop giggling with gleeeeee. This book is so intense, and yet hilarious in Kristen Ashley’s perfect way. She freaking yippee’d!!! Dee: No way! I’m reading this right now! God I love this book! Lori: It started so intense, you we’re right in! I love the language barrier! Mariel: Oh Maryse… I know you… You’re gonna have the… OH NO! HE DID NOT! Moment lol I love me some Lahn! Jessica: OMG! Yes I loved that book!!!!! I can’t say it enough! Maryse’s Book Blog: “Mayoo!” “I can’t “Mayoo” Lahn, you’re like six foot seven. You’ve got a whole foot on me.” LOL! Damn she’s funny. I can’t stop giggling. This is the most endearing relatable character in such an unrelatable world. I. Am. Loving! You guys weren’t kidding when u said this was one of her best. Molly: Loved loved loved this series! Cannot wait until December 27th for the next installment! Was in a book slump until I read these! Sarah: I’m so excited that you’re reading this Maryse! Can’t wait to hear what you think of the rest of the book! Maryse’s Book Blog: Okay u guys are gonna hold my hand. Right now I’m in awwww-mode ’cause of the sweetness of learning each other. But I’m scared (and excited for) the OH NO HE DIDNT moment. Eeeeep!!! When it comes to books (see how I put that in there ) there is NOTHING better than winning the heart and smile of that angry, hulking, brooding, scowling warrior. NOTHING better. Maryse’s Book Blog: OMG I’m IN LOVE!!! I’m so silly!!! It’s just the “Gingoo” drink scene and Im giggling like a schoolgirl. THIS feeling is why I read. Erin: You get a good dose of “the feels” with this one!! Violy: I love dax Lahn! Golden Dynasty is my fave KA book. Meagan: This book couple also reminds me a whole lot of Kahleesi and Kahl Drogo on Game of Thrones and I love them!! I glared into his eyes as his hand glided up the skin of my side. “All right, rayloo. I’ll rayloo, whatever the hell that means,” I grumbled. Okay… I just SO cackled in glee again. Ashley: I’m reading Wildest Dreams right now. I can’t not read her books in order no matter what I do. I’m not sure why I held off on this for so long, but it’s perfect fantasy + KA! Sarah: You so have to post when you get to the oh $&@: moment. I’d love to see your reaction…if you can even pull your eyes away from it of course. Its so bad yet so good. Pure KA gold. Alyssa: You haven’t read it???????? Love the fantastical series!!!! Wait. You’ll be laughing and sobbing alternately! Have you EVER seen so much love for one book? I could make an entire “book review” just on the reader comments and subsequent discussions for this book alone. And there’s a reason for this. My GOODNESS I LOVED THIS!!!!!! There is SO much to experience here. From misunderstandings to mistreatments, pure and beautiful “falling in love” to intense jealousy, injustices and concessions. It’s heartwarming, inspiring and so romantic I was a puddle of golden mush the entire way through. Ahhhhh to be loved by an unassailable King, an invincible warrior… and best yet, just a beautiful man (although frequently brooding and growly <— just the way I like ’em ;)), named Lahn. Any “Circe’s” out there? Watch out when you go to sleep tonight… you never know. 😉 Lucky girl! Pure Kristen Ashley perfection. Treat yourself to the kind of romance you read for. This is it. I love KA!! Does this series have to be read in order? Love this book. This was my second ever KA book I read (after Knight) and it was so freaking awesome. I read the 1st in the series and it was good, but not to this level. The 3rd book is another of my favorite KA books and I can hardly wait for book 4! U sold me. I one clicked it. U haven’t gushed like this for awhile. I like you Maryse shied away from this book because it is a fantasy…..but seeing how much you love it I am going to give it a chane. I just bought it…I do love all KA books. Maryse, I’m so glad you finally read Golden Dynasty. I knew you would love it. It encompasses you entirely.,Thete is just soo much there. Your granted with everything. Kristen Ashley by far is one of my favorite authors, and I have you to thank for. I started with ” The Gamble” and have read evrything she has written ! It’s a ride I don’t ever want to get off. I’m just soo glad she writes soo many books within one year to keep me completely entertained and enthraled ! Thank you again! Rock On! OMG Maryse I have been tryig to find the right moment to start this series as I also feel the exactly the same about “fantasy” as you do. But this review totally sold me on starting it and it is a super bargain at the moment on Amazon UK. I’ve read all of her contemporary novels but I don’t do paranormal books. Maybe it is time I gave this a shot. Thanks for the review. Reading this one now, & so read your review carefully, so I wouldn’t get ahead of myself with the story, but lately I seem to be reading the same books at the same time as you. 13% into Wildest Dream – OMG! It’s like my two favourite worlds colliding Kristen Ashley’s alpha males and PNR. I am in my happy place, thanks for the tip Maryse! Excellent review!! When I read this I had my kindle open to the book and my iPad open to the glossary at the back. I even had paper and pen so I could write out the phrases. I LOVED this book so much… That KA punch was so intense in this one. I’m like you and out this one off for months thinking alternate universe? Nah. But whoa was I wrong. GD is my all time fave KA book and Lahn is my all time fave alpha. This whole series is perfection. I always shy away from “fantasy” as well, but seeing as I loooove KA and had read all her other books, decided to give it a shot. Love all 3 books in series. The “Three ” series is also good. Oh who am I kidding, everything KA is good. So glad you read & reviewed this. I have the 2 books in the series because I love Kristen Ashley, but just hadn’t read them. Thank you! Maryse…FINALLY!!! So glad you reviewed this book! I’ve been dying to see if you fell as hard for Lahn as I did! I feel like I’ve been a KA stalker since I finished this series and have been waiting NOT so patiently for Broken Dove. I’ve read and reread this series so many times, I’m embarrassed to even admit it. Not my genre either, but I’m a believer! Happy holidays!!! Reading now….and agree, this may be my favorite KA book. And my first thought was of Game of Thrones….knew immediately where the inspiration came from and loving every minute of it. Don’t shy away from this book because of the “fantasy” element. Kristen Ashley knows how to write. Period. And this is her very best, so you are seriously missing out on a whole-lotta-fun if you don’t pick it up. It will grab you from page one. No joke. Just like Kresley Cole’s style, it starts out in the middle of the action. And she’s such a great heroine. And he’s…. he’s…. he’s…. so dang BAD… bad bad bad…. and you love him anyway. ACK! Be prepared to stay up late, and don’t be surprised if a few days later you want to reread it because you miss them all so much and everything else is just so meh after that experience. I loved reading your review and experiencing it again through someone else. Such a great book. I LOVE.LOVE.LOVE. Kristen Ashley. She is my favorite!!! All that to say, I also shied away from this series, but I started this book yesterday, I’m in love!!! Can’t wait to finish!!! It was perfect. I loved it so much. It’s in my top three of this year. Amazing book. Glad u sold me Maryse! Joy, I’d love for you to let us know what you thought. Over the past year I have been working my way through most of KA’s books and absolutely loving them, but this book is by far and above my favorite!!! I am like Maryse avoiding the fantasy aspect and thinking nothing could beat Sweet Dreams or Motorcycle Man but I was clearly wrong. I am now going back and reading the first in the series and hoping that it can live up to The Golden Dynasty but somehow I don’t see how it could so I hope I am not ruined for all other KA books since I love them so much! I like some fantasy but have read the synopsis of this series several times when desparately searching for all things Kristen Ashley and just didn’t think I would be interested. But you have me convinced so I just purchased all three that are on sale for $ .99. I am loving this book so far!! It’s just what I needed and can’t wait to get to my reading as I mostly read at night. Wow it’s soo different and yet the writing is smooth and I feel like I’m right there along for the ride. Would not have picked this one out on my own so thanks for the enthusiastic review!! Let me say…I was totally against starting this series because of the “fantasy” part but going on your “tip” I decided to give it a try. I started with Wildest Dreams and went from there…and girl; YOU WERE RIGHT! Dax Lahn IS the man! I really enjoyed all the stories. I won’t say they all rated a total 5 but for the most part they hit 4 to 4.5 but I’ve never read ANYTHING I could compare to The Golden Dynasty, just WOW! But alas, Apollo in Broken Dove was THE man for me. The story moves forward and though KA says just one more book in this series I am hoping her “fans” encouragement help her see the error of her ways. There are SO many people in Book 4 deserving of a HEA! As usual, KA blew me out of the water with all her alpha maleness. NOBODY does alpha quite like she does…. THANK YOU THANK YOU for forcing me to choose a book that was so far off my radar (even if it was a KA book) it wasn’t even funny. Now I’m off to start her Ghost series…hmmmm I’ll let you know. Excuse me…did you say think Drogo from the game of thrones? SOLD! I am only about 10% in but am enthralled. I’m totally thinking Drogo ( hubba hubba!) and am in my ether…. As soon as I finished I dug back in to re-read my favourite parts. Lahn was totally Drogo and it was totally awesome. I was tempted to get into her other Fantastyland ones but think I’m going to break and read Surviving Raine first. Loved your best of the year post. Will probably read most of them! I know I’ve seen a “What to read after Golden Dynasty” list but can’t seem to find it. Help!